TSS4U, a specialist solar system integrator, has incorporated the Alcad batteries, solar photovoltaic (PV) modules, cathodic protection equipment and controllers into six autonomous systems that will protect the integrity of gas wellhead casings. Alcad supplied a total of 114 cells in six battery systems, each of which comprises 19 Alcad PV1115 cells. Each battery system stores up to 1030 Amp-hours (Ah) of energy and supplies 24 Volts (V) to provide up to 3 days of autonomous operation for cathodic protection and up to 7 days of power for communication and control equipment. At the heart of the solar-powered cathodic protection application, the battery systems are designed to store solar energy throughout the day and discharge it to provide a continuous electrical current to the steel wellhead casings that maintains a small electrical charge in the steelwork. This charge prevents the chemical reactions that happen naturally when steel corrodes to iron oxide, also known as rust. Because overcast days are rare in the desert climate, 3 days of reserve energy will ensure that the system is able to operate continuously. The cathodic protection systems will provide confidence in the structural integrity of the wellheads. As a result, they will reduce the need for maintenance and manual inspection of assets in remote and inhospitable sites. Alcad's battery systems are based on its PV solar cells. They are purpose-built for solar-powered applications in off-grid and remote industrial applications. Alcad's PV solar battery systems are capable of achieving a long and reliable lifetime of up to 15 years in the Qatar desert, where temperatures can fluctuate from 5˚C to 50˚C. A long lifetime is important in reducing the Total Cost of Ownership (TCO) of a battery installation and optimizing running costs for remote facilities, where logistical costs for replacing time-served batteries can be significant. High temperatures can impact the performance of batteries, with the lifetime of lead-acid batteries dropping away as the temperature rises. 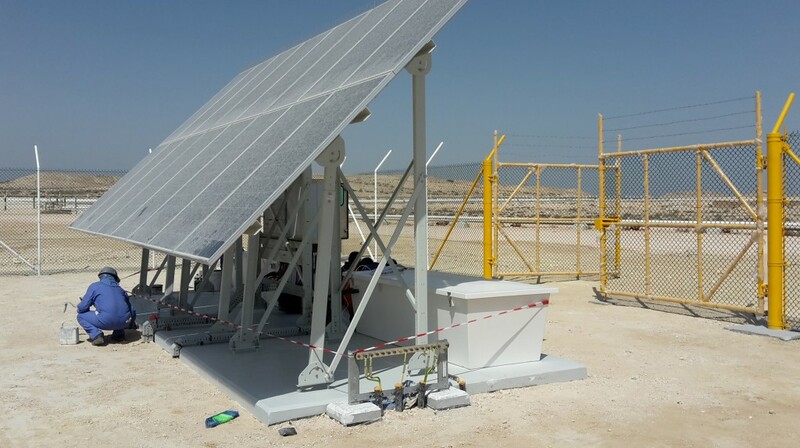 However, nickel technology batteries such as Alcad's PV solar batteries can tolerate high temperatures, meaning that they are well suited to oil and gas installations in the Middle East.